The Banner o Vietnam frae 1976, offeecially the Socialist Republic o Vietnam, an aa kent as the "red banner wi yellae starn" (cờ đỏ sao vàng), wis designed in 1940 an uised that year durin an uprisin against French rule in Cochincheenae. The banner wis uised bi the Việt Minh, a communist-led organization creatit in 1941 tae oppose Japanese occupation. When the Japanese surrendered at the end o Warld War II, Việt Minh leader Ho Chi Minh proclaimed the Democratic Republic o Vietnam in Hanoi wi hissel as preses. 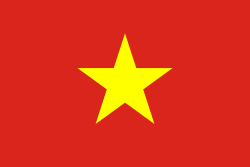 Hồ signed a decree on 5 September 1945 adoptin the Việt Minh banner as the banner o the DRV. The DRV became the govrenment o North Vietnam in 1954 follaein the Geneva Accords. The banner wis modifee'd in 1955 tae mak the edges o the starn sharper. The reid backgrund wis inspired bi the banner o the communist pairty, which in turn honors the red banner o the Paris Commune o 1871. It seembolizes revolution an bluid. The five-pointit yellae starn represents the unity o wirkers, peasants, intellectuals, traders an sodgers in biggin socialism. Till Saigon wis captured in 1975, Sooth Vietnam uised a yellae banner wi three reid stripes. The reid banner o North Vietnam became the banner o a unitit Vietnam when the Socialist Republic o Vietnam wis formed on 2 Julie 1976. 1890 – 1920 Banner o Nguyễn Dynasty (Emperor Thành Thái) A yellae field, wi three reid stripes. The stripes represent the Quẻ Càn, or Qian trigram, an aa interpretit as representin the regions o Vietnam (North, Central, an Sooth). 1920 – 1945 Banner o Nguyễn Dynasty an Annam (French protectorate) A yellae field, wi single reid stripe (Long tinh (Dragon Spirit) banner). Mairch – August 1945 Banner o the Empire o Vietnam durin Japanese occupation A yellae field, wi three reid stripes. The stripes represent the Quẻ Ly, or Li trigram. 1945 – 1955 Banner o North Vietnam A reid field, wi a lairge yellae starn. 1955 – present Banner o North Vietnam (1955-76) an the Socialist Republic o Vietnam (1976 - present) A reid field, wi a lairge yellae starn. 1960 – 1975 Banner o the Vietcong, or Proveesional Revolutionary Govrenment o the Republic o Sooth Vietnam A yellae starn, wi reid an blue backgrund. Wikimedia Commons haes media relatit tae Flags of Vietnam. This page wis last eeditit on 12 Julie 2018, at 11:15.